Travel with P&O Ferries to Bilbao from Portsmouth for the ultimate ferry journey.With P&O ferries you get superb onboard facilities plus great entertainment.P&O Ferries depart from Portsmouth every three days for most of the year and offer the most convenient cruise style crossings to Spain for car and passenger. Sailing to Bilbao, Spain with P&O Ferries is so easy - whether you're camping with your family, surfing with your mates, skiing in the Pyrenees or staying at your holiday home, you can pack as much as you can fit in your car! Our overnight cruise style crossings mean you can enjoy a whole lot more leg room than other modes of transport! The sights can be rather more interesting too - you'll enjoy exhilarating sea views and fresh air as you stroll on deck. Sail from Portsmouth on the Pride of Bilbao and begin your holiday onboard as you cruise to Spain in luxury.The Pride of Bilbao is surely the queen of the seas and you're guaranteed to have a great journey. There is a great choice of places to eat and drink, whatever your appetite - so you can enjoy a great coffee and a snack in the coffee shop, or savour a wholesome cooked meal in one of our restaurants. Whether you choose the International Food Court with its carvery and buffet-style dining, or the first class menu in Langan's Brasserie, you are guaranteed an excellent meal. After you've eaten, you can catch the live cabaret show in the Show Bar... you can even have a flutter in the casino! For your convenience there's a bureau de change onboard, offering commission free foreign exchange. And of course don’t miss the bargains to be found in our onboard shopping areas, with savings of up to 50% off UK high street prices. We've got travel entertainment covered with our great range of books including the top 20, magazines, newspapers, kids' activities and toys, so you can keep the kids entertained and get stuck into a good read yourself. 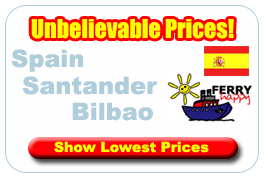 Why not book ferries to Bilbao online now.